Bob: Increasingly, these opening scenes are my favourite parts of the episodes… the conversations between our three heroes are always fabulously funny and well-observed. Compo: We used to roll Eileen Watkins down this hill. Foggy: What did she look like? Clegg: Very dusty, and covered in bits of grass. Cracking stuff, as is the traditional childhood reminiscing, complete with typically florid names and descriptions for unseen characters. 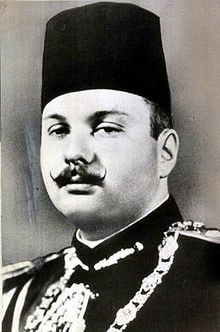 Eileen Watkins, it transpires, was in love with Chunky Rumbelow, and was actually a dead ringer for the late King Farouk of Egypt. Complete with twirly moustache, do we assume? Andrew: It’s quite stylishly directed as well, with each character literally as well as figuratively having their own perspective; Clegg standing, Foggy sitting, and Compo lying. It just seems a little more carefully composed than recent episodes. Maybe the director had a little bit of extra time. 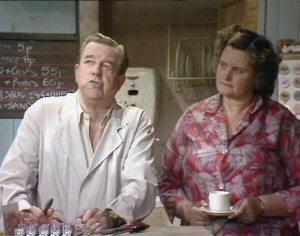 Bob: Should I be surprised that Sid and Ivy have a microwave oven in 1979? I always think of them as a quintessentially 1980s invention, and am taken aback that someone as – ahem – traditionally-minded as Ivy would have one anywhere near her precious kitchen! I’m pretty damn sure I’d never even HEARD of a microwave in 1979. It were all pressure cookers and deep-fat fryers when I were a lad. Andrew: It’s never been mentioned before, but if they don’t know how to use it then this might explain why our trio are so often unimpressed by their grub. The scene in the café is great though, with a rare chance to see the dynamic between Ivy/Sid and Nora/Wally. There’s still something quite antagonistic between Nora and Ivy here, but I love how quickly they bond in their natural habitat – the kitchen. I love how, even on her day out, Nora isn’t content until she resumes domestic duties. And just what is the expression of a man who knows what he’s doing with a microwave? Bob: This is, of course, Wally’s idea of taking Nora out for a meal, the old smoothie. ‘Your pastry’s not light enough,’ she snaps, stony-faced, reducing Ivy to tears! At which point Nora softens too, and offers gentle advice. It’s interesting how we’ve seen the relationship between these two women develop over the years, am I right in thinking that they barely seem to know each other in the early series? Here, there’s clearly at least a grudging respect between, and then – in later years – they become firmer friends. Andrew: Yes, I think the first sign we saw of a developing relationship was during the seaside episodes. This is a pleasant continuation. Bob: It’s interesting to see friction between Sid and Wally as well, when it comes to repairing the microwave! Women are competitive about baking, men are competitive about fixing things. Them’s the rules in Summer Wine world. Andrew: People whose sauce bottle tops looked like they had ‘bunches of raisins on ‘em’ were the bane of my childhood existence. I loved and still love red sauce (I’d even fill my Yorkshire puddings up with the stuff), but I equally hated the muck that would build up. Just the thought of one dropping off into my food… ugh. May Earnshaw bless the inventor of the squeezy plastic bottle! Wally: They do say the Japanese are very gifted in the trickier aspects of the marriage bed. Bob: And so, after some nice character work, we get to the crux of what is clearly shaping up to be a stunt episode… Compo wants to go hang-gliding. And Wally volunteers to build the craft in question. Should I be ashamed of saying that I find Compo a bit annoying in this episode? I prefer his darker-edged persona of the early series, when he was almost a drop-out from normal society. Here, he’s essentially a child in an old man’s body, pulling faces and putting on comedy voices. Anywhere know where this actually IS? We need to visit it! 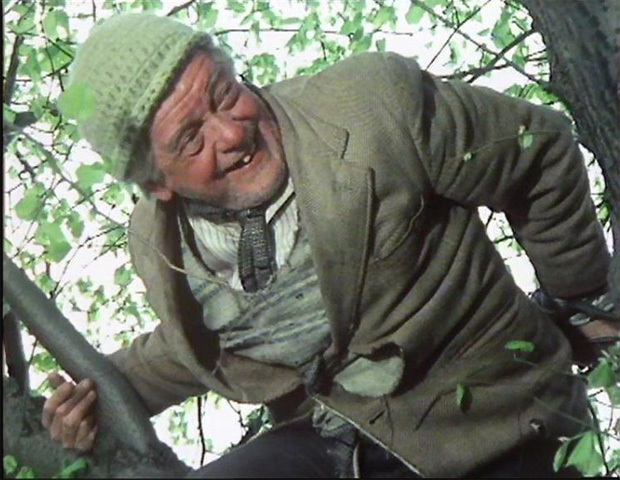 Bob: And so we finish with a tree-climbing competition between Foggy and Compo, and – hooray! 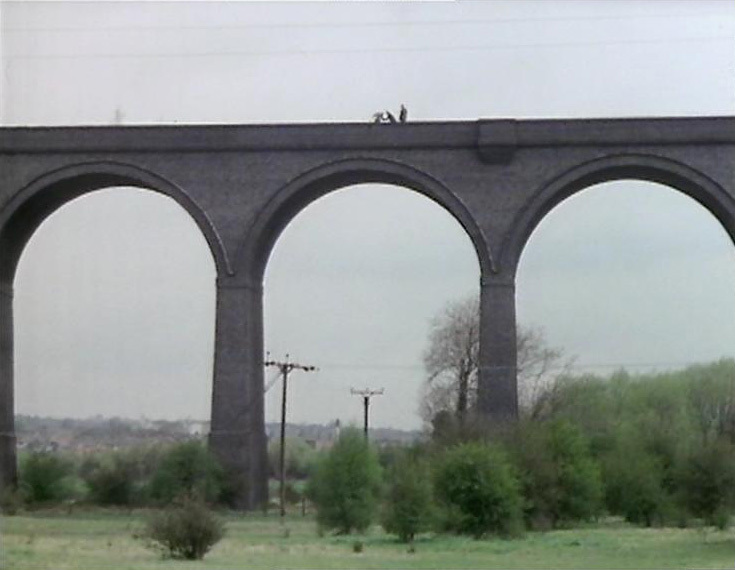 – a credit for Stuart Fell, the former Parachute Regiment stuntman beloved of Doctor Who fans. It’s a rare CV that includes spells doubling for both Bill Owen and Katy Manning, but Stuart’s pulled it off with aplomb! Is he also the only performer to have appeared in both Last of the Summer Wine and The Empire Strikes Back? Or do we have a Michael Sheard guest appearance to look forward to? Andrew: That sounds like a challenge to me. So I’ve done the leg-work and discovered that stuntman Peter Diamond, a Snowtrooper Guard and Stunt Arranger for Empire played the role of ‘Motorist’ in the 1990 episode Barry’s Christmas. Now, I am the master. Bob: He’s the Tusken Raider who attacks Luke Skywalker in the first Star Wars film, too! Anyway… an enjoyable enough episode with some nice moments, but I have a curious feeling we’re being set up for another sequel. Andrew: That’s just ‘cos you’ve seen the back of the box. Based solely upon viewing this episode, I would never have suspected another instalment was coming.